Feeling || Really settled believe it or not!! Loving our new place & feeling like we've been living in here for more than a week! Watching || G has the Apple Keynote on TV...I'm patiently waiting for my turn with the TV! I have been watching a ton of the US Open! 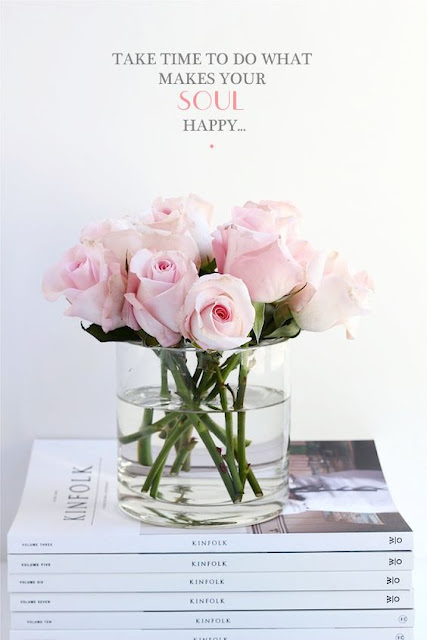 Enjoying || All my pretty flowers that are still alive!! I can't keep flowers alive for anything...that was until I found this tutorial!! It works folks!! Making || Lists of things we need to buy for the new place, things I need to post on eBay & packing lists for next weekend! Cooking || For the first time in over a month, I've actually cooked not just heated something up!! We made a super tasty steak stir fry! 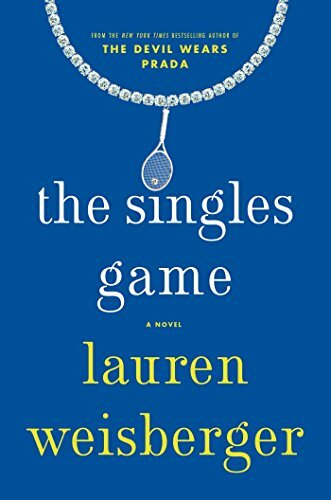 Reading || I just finished The Singles Game and really enjoyed it!! As a former tennis player, I was really into the technical side of things, but I appreciated how the author incorporated current tennis players (without using their real names) but if you follow tennis you know who she's talking about! Of course there's a love story in there...so that made it even more enjoyable! Wanting || Friday to make an appearance! I have my 2nd acupuncture appointment and I'm so looking forward to it! Looking || At all the fall clothes and accessories! I just ordered this hat ($13) from my early fall wishlist and I'd like to add a few easy long sleeved shirts to the mix to easily mix and match with jeans and booties! Daydreaming || About all the potential couples we have for next year...4 so far and I'm hoping for more!! My 30 before 30 list had "planning at least 5 weddings" and I will definitely be marking that one off the list! Smelling || I jumped on the essential oil train...sort of! I picked up this Everyone Aroma Therapy Oil Diffuser to have in the living room / kitchen and I'm loving it! It changes colors (if you want) or that setting can stay off and I also picked up the lavender & relax essential oils. I love that it's not overpowering, but if I cook something like fish (which I did on Sunday night) after a few minutes the smell was completely gone and it smelled so good and I felt relaxed! Planning || We have two weddings at the start of October so it's crunch time now! Also planning a last minute trip to see my friend and her babies in Philly! Thinking || About blog post ideas!! 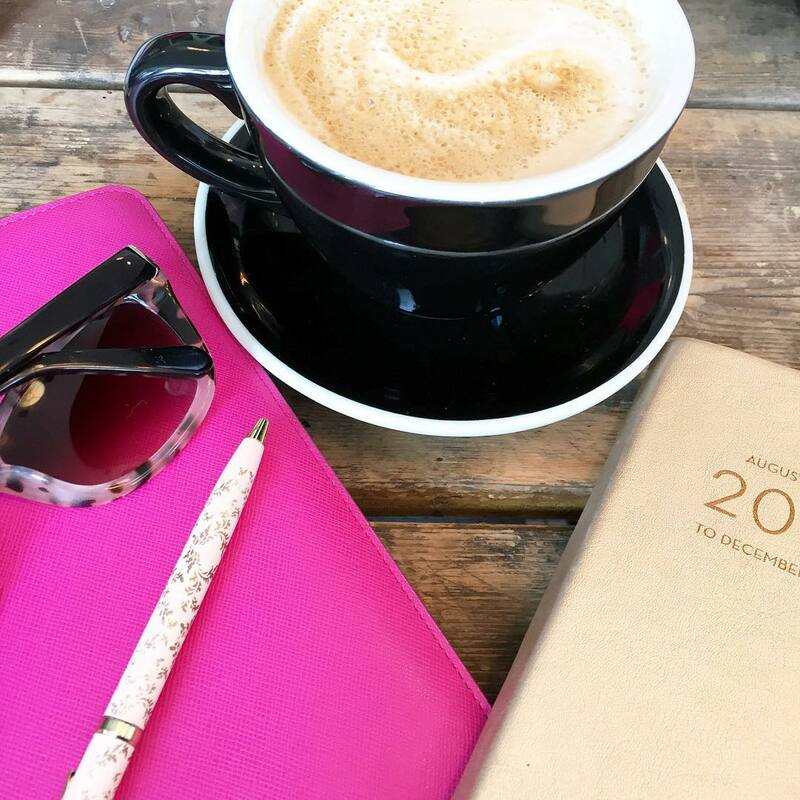 I can't believe how quickly summer flew by and I'm trying to get back into blogging 4 days a week! Coming up with content is proving to be harder than I remember! Any posts you'd like to see?! What's currently going on with you?! Yay for being settled in your new place!! I'd love a home tour once it's all done and maybe ideas for decorating on a budget? Happy Thursday!! Yes a tour of your new place would be perfect! I love the little sneak peak you gave us of the kitchen :) So glad you're settled in though! I agree with both girls on a tour! 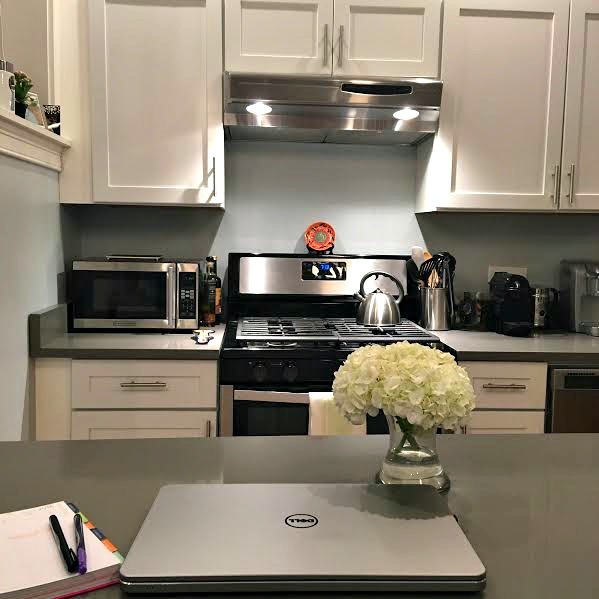 Your kitchen looks too cute - especially with those pretty flowers. Sounds like I need to get some lavender. Feeling extra relaxed can never hurt! Have you done a "pet peeves" post before? I am so glad that you are getting settled into your new home! I really need to jump on that aromatherapy band wagon! They seem so beneficial, and who does not want their home smelling nice? I love that book. I'm so curious to know which tennis stars are the ones she is speaking about!? And the aromatherapy sounds wonderful but I love my old school candles too! Yay for being settled in and cooking again! That's got to be the best feeling ever!! I'd love to see a tour of you new place too! And yes to looking at all the Fall clothes/accessories! Moving is always hectic - it's awesome that you are feeling settled already! I really want to read The Singles Game. I need another diffuser and will check out your link! Have a great day! So glad you are settling in! Yes getting back to blogging after the relaxing Summer is definitely tough! I'm reading the same book right now! It's really cute so far. Y'alls kitchen is adorable!! yay for essential oils. and i just love my diffuser. and yes to buying all the fall things. and being settled! happy friday eve! Cute post! Love fresh flowers! That's great that you're already all settled in! It's amazing how much stuff you need to get organized in a new place right? I love and hate that part. Congrats on 4 weddings next year! That's awesome girl. Post ideas: tour of your new place? tips on managing a side gig w/a FT job? Your new place looks gorgeous! Hope you do a home tour! I'm eyeing up all the fall clothes too! Something about fall just makes it better! I'm all about tennis myself so I need to check out that book. I need a new diffuser. I bought mine to work & need a new one for home. I'm going to check that one out. Glad you settled in so fast in your new home. So glad you're already feeling settled! I have that floppy hat & I love it!! A new place tour would be really interesting! I always love seeing how people set things up & getting new ideas that way! I'm sure it feels so nice to be settling into your new place- it looks amazing. I keep seeing that book pop up, though I'm wondering if it will give me flashbacks to when I had to take tennis in college as a PE class and I was a disaster! haha. Glad to hear you are feeling settled! And yes, the US Open has been on constantly in our house since it started last week. I told my husband I'm going to be so lost when it's over! I obviously have to add this book to my list!! Sounds so good. Have a great weekend! I'm glad that you're feeling settled in your new home! That is so awesome that you guys are all settled in, that is me. I have to unpack and get that settled feeling immediate, even if there is more stuff to purchase or do I make the best with what I have. So exciting for all the weddings you guys have booked up! I know you will make your goal. This fall is so hard for me because there are so many cute clothes and I fit in nothing :( Haha probably best for my bank account! Go you for rocking summer and an upcoming busy Fall season for you!! Awesome that you've kept the flowers alive, I'm terrible at that so I'll have to watch that tutorial! Glad you guys are settling in perfectly into your new home! I LOVE your new kitchen, girl! You have to share a post once you've finished decorating, I'd love to see! I purchased most of the new decor pieces at HomeGoods and I'm still adding, it's nowhere near complete, especially my office. I love the new hat you got, it's the perfect shade of grey to transition through all the seasons, great choice! Oh, I don't know if you happen to know this, since you just discovered this video, but does the dish soup trick work on all flowers or just hydrangeas? I have fresh flowers now and I want to keep them alive as long as possible! 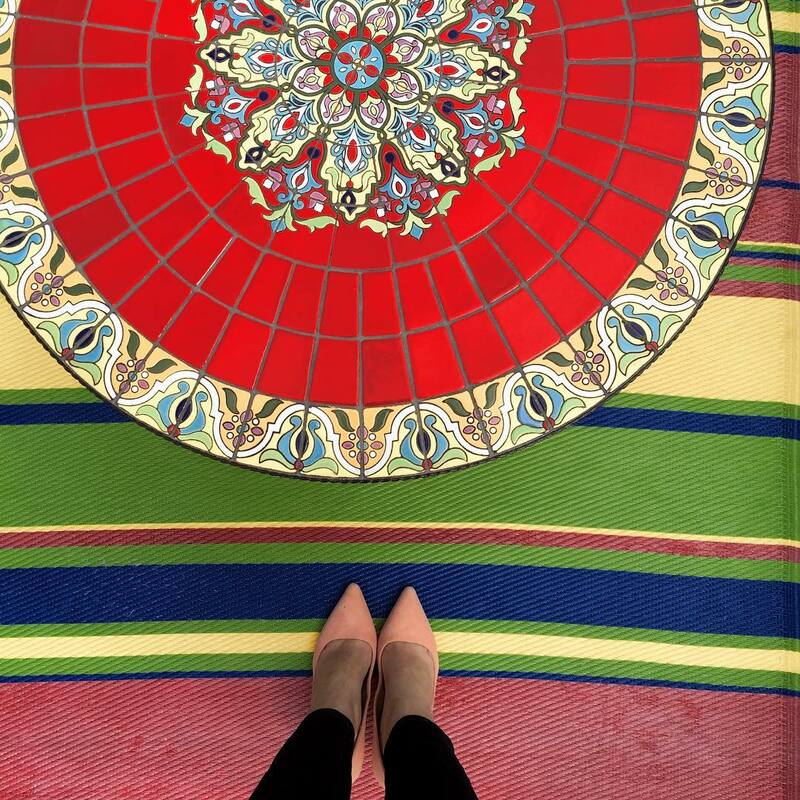 Thanks so much for sharing, beauty, and I hope you're having a great week so far! I'm so glad to hear you already feel at home in your new place! That's the best! So glad you are feeling settled in and like you've been there for a long time, that's how you know it is the place for you two! You'll have to share more on acupuncture...did it hurt at all? I've considered it, I've heard it's good to help conceive. I'm having a difficult time brainstorming blog post ideas too...I don't remember having a hard time last year. I'm sure you'll come up with some great posts, you always do! After you go through a few more rounds of acupuncture you should totally do a post on that! I would love to hear more about the details and your experience with it (why you're doing it, how many needles they use, how long you have to lay there, how you feel during and after, etc). One of these days I'm going to try it! I've been putting it off for years! And, of course, you need to do house tours once you get settled! The new place looks so pretty - loving all the fresh flowers! The Singles Game is on my reading list, so I'm happy to hear that you enjoyed it. And, you go girl with all those weddings! Ahh your kitchen is so pretty!! So Griffin got me hydrangeas to surprise me after I got home from the bachelorette party and they died within two days, he was so mad! So I just showed him that youtube video and he goes ummmm I watched the before putting them in the vase and did that but it doesnt work haha! I told him they must have been bad flowers to make him feel better haha! Yours look amazing! Your kitchen is so cute!!!! I love the white! So glad you're already feeling at home in your new place. Can't wait to see more of that beautiful kitchen! I love essential oils too, for aromatherapy and also just for making things smell pretty! (Including me if I have to run an errand after a yoga class, hah!) Would love to hear more about acupuncture if you're up for sharing; I'm trying to convince my boyfriend it's something worth giving a shot! Your new place looks amazing, I can't wait to see more! I love your cabinets! I've been considering acupuncture but I'm still kind of skeptical, I'd love to hear more about it! I love that you're already feeling settled into your new place! It usually takes me a while after moving. But it's the little things like flowers and nice candles that help! You are totally going to crack the heck up....I seriously read your sentence about searching for 4 more couples over and over. I was like why are she and her hubs daydreaming about potential couples. Seriously laughing out loud over here right now!!! I get it...i get it...the blonde just took over briefly. I can't keep flowers alive either, totally looking at that tutorial asap! Enjoy that acupuncture appointment girl!! So glad you're already feeling settled in the new place! It's the best! And I really need to jump on the essential oils bandwagon..it sounds like great stress relief and I need that in my life! Loved seeing a peek into the new place! Keeping mine in the fridge is my only flower tip, so I will def be checking that link out! I love your new kitchen, it's so fab! Glad to hear that you settled in nicely. I totally cannot keep flowers alive, so thanks for sharing that link. The kitchen in your new place looks beautiful! I love using essential oils. Your new kitchen looks so cute!! And I'm a huge fan of diffusers. I have one in my apartment too! Yay for feeling organized! Checking out those flower tips and I may need to get that book! Hope y'all have a wonderful weekend! Hope you and Gary are adjusting nicely to your new place! Getting into the swing of things is always rough. I'm running over the week of not blogging mark and keeping a list of what I want to talk about when I get back! I diffuse in the bedroom at night. I love it! I'm reading that book right now and love it! You have so much going on and coming up, I am so excited for you!!! Congratulations! Looks like a happy life is going on for you! I am going through a lot of transformations right now so I don't have much to say at the moment! The acupuncture interests me. I am super stressed pretty often and I wonder if it would help me too. I have seen these type of diffusers everywhere and think I want to get one. 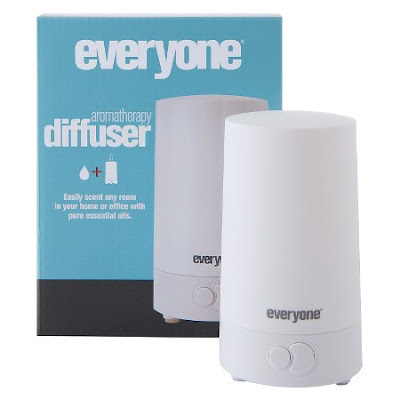 I haven't jumped on the essentials oils train yet but that diffuser sounds fabulous and probably perfect for us with indoor pets. You move being done is so exciting - glad you are loving your new place! I love my essential oils . . . there's so much you can do with them, but I really just diffuse them . . . loving the fall smells right now and citrus is a great odor killer as well! You know I love that you got a diffuser! You will be so happy you did. I adore your new kitchen btw. It's so pretty! So glad that you're loving your new place! The kitchen is super cute. I've been diffusing Lemongrass and Lavender or Young Living Purification to eliminate smells - kids can smell so bad sometimes! Ha! I'm really glad you love the new place! That's really exciting! Our home didn't feel like 'our home' until at least two months in. And I was looking into adding The Singles Game to my reading list, glad you liked it, I've been hearing good things about it. As you know well I love these currently posts. So good you are already settled in your new place. Kitchen looks good with fresh flowers and nice-smelling oils. Girl you have a very busy rest of the year and so many weddings coming up. How do you do it all?